Understanding how any technology used in campaigning functions as a tactic to further your campaign strategy is essential. For every training session that Fabriders runs, whether it’s about utilising data effectively or social media, we’ve found it important to start with an exercise that gets participants to thinkabout the goals of their campaigns and the tactics that might bring those goals closer. This series of exercises has evolved from “The Half-Wheel and the Pyramid.” , putting the Spectrogram as the foundation of the exercise. Please do let us know if you find this helpful or if you modify it to better meet your needs. Ask the participants to think about what they are trying to achieve that is SMART and write that goal in one sentence. This will be their campaign goal. Step 3 – Who are Your Stakeholders? Stakeholders are all the people who are involved or impacted by the change they seek; for example, members of the communities concerned, the press and media, government officials, etc. 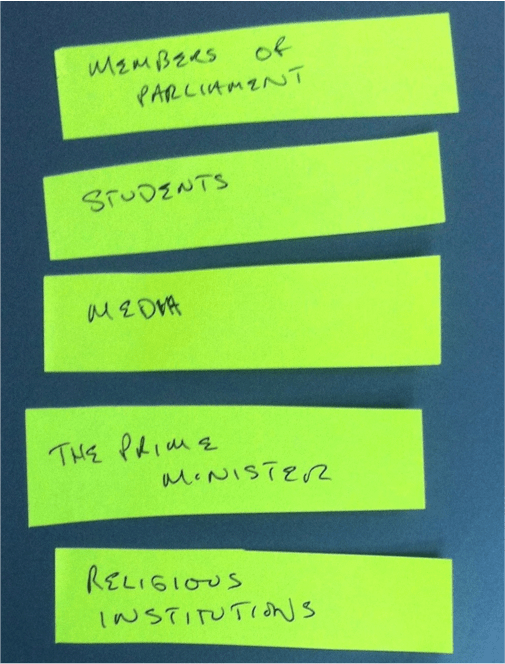 Now, ask the participants to list all the stakeholders involved in the campaign, writing the name of each stakeholder on a separate post-it note. 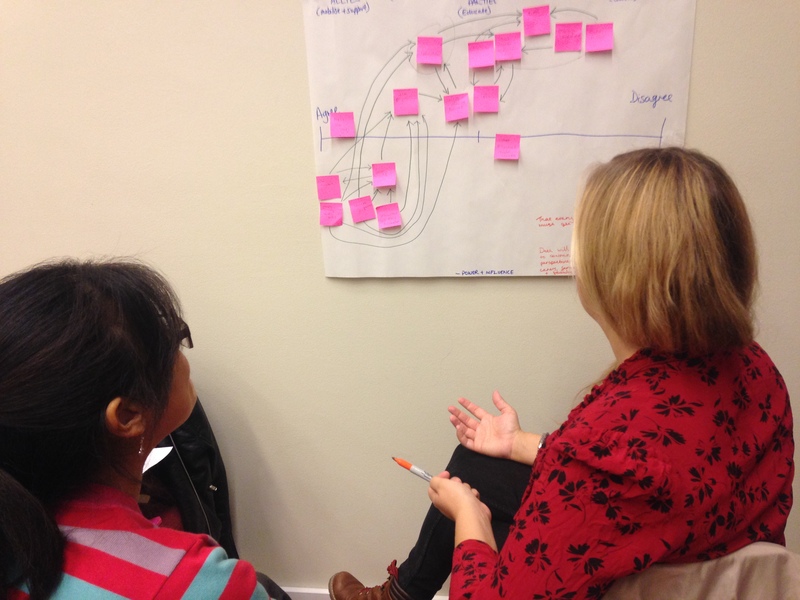 Now give participants a piece of flip-chart paper and position it to landscape. Ask them to draw a straight horizontal line across the middle. At one end of the line they should write support and on the other end they should write oppose. They should now review their campaign goal and their stakeholders. They should arrange the post-it’s along the line based on the degree to which they support or oppose with the campaign goal. After they have done that, they should divide the line into three equal parts. Allies are people who are already engaged and support the campaign. Some of the stakeholders that they’ve listed may fall into more than one category according to circumstances – if so, place them on the border line between the two categories. Allies are the people they need to mobilise. Neutral Parties are the people they need to educate (to transform them into Allies). Opponents are the people whose arguments and actions they need to counter. Stakeholders who lie on the line between Neutral Parties and Allies are the people they need to motivate, to make them into Allies. Those who are between Opponents and Neutral Parties are the people that they need to persuade to reconsider their positions. Now engage the participants in a discussion about each type of stakeholder, and about activities that can be undertaken with each: this will help participants to identify the right tactic to use for each of their stakeholders. Give them the information they need. Engage Opponents in face-to-face meetings and Forums. Counter the arguments that they present in debate. Use Neutral Parties to educate and to engage Opponents. Step 5. The Vertical Line of Power. Who has the power to make the change that you seek? This may be one individual, who will make a final decision, sign a law or change an existing policy: the head of a government committee or a regulatory body, say. It might also be the head of a corporation or the chairperson of a governing board. Participants should identify who can make the actual decision that’s necessary, the entity or person who would have to say ‘yes’ or approve a law in order for the desired change to happen. This person or entity should already be on the spectrogram line, but if they are not, you should make a post-it note for them and put it on the half-wheel, noting where they fall on the line. 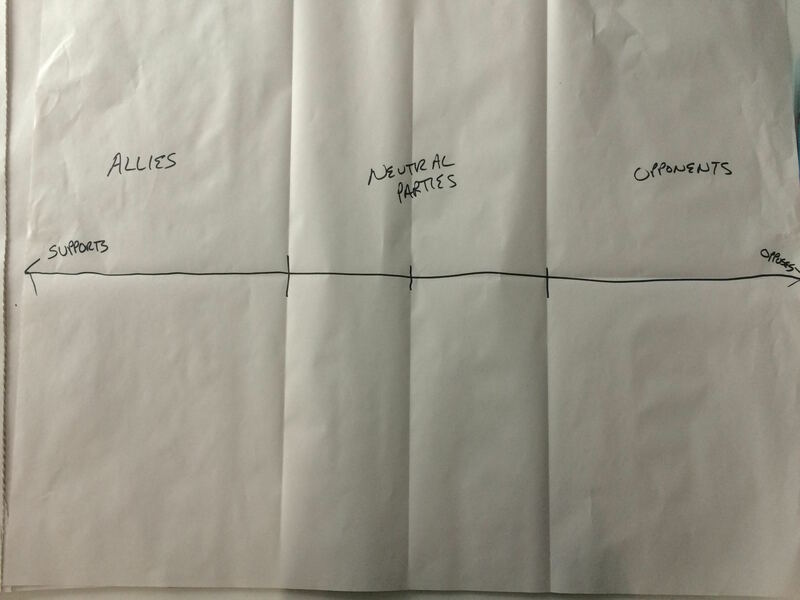 Now ask the participants to draw a vertical line down the middle of the flip-chart paper. At the top of the line they should write ‘most power’ and at the bottom of the line they should write ‘least power.’ Without moving their stakeholders from their postions on the horizontal line – they should move them vertically according to the amount of power they have in making the change. Now get them to draw lines between stakeholder that have relationships and can influence each other – paying particular attention to those that are connected to those with power. Who doesn’t have power but should? Now get them to identify the stakeholder that doesn’t have power but should. Get them to think about how the campaign could work to help them build power. What is the role of data and tech in the campaign? From here you can get them to think through how they can use data and tech in their campaigns. For Data: What statement would their campaign need to make to have the greatest impact? And how will data support that statement? This can be a starting point to think through the role of info-graphics and data-visualisations. For Social Media: How can they use social media to learn about stakeholders. How do can they use social media to influence those with power? See: The Listening Cycle.